WACO, Texas—Texas Farm Bureau (TFB) has honored Israel Flores, a fourth grade teacher at Gilbert Mircovich Elementary in Ingleside, with its 2012 Agriculture in the Classroom Outstanding Teacher award. 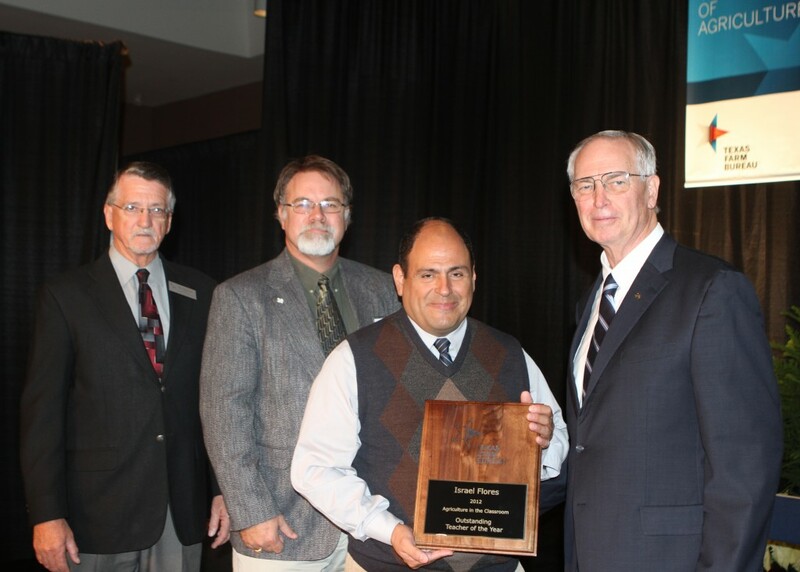 Flores received the award during TFB’s 79th Annual Meeting Dec. 2 in Waco. Nominated by San Patricio County Farm Bureau, Flores received the award for his exceptional work to incorporate agriculture into his classroom lesson plans and activities. Flores is a graduate of Wayland Baptist University and has 30 years of teaching experience. In addition to introducing his students to agriculture through science, social studies and writing, Flores’ classes also participate in TFB’s Agriculture in the Classroom presentation each year. In recognition of his accomplishment, Flores will receive a $300 cash award, as well as reimbursed expenses to attend the National Agriculture in the Classroom Conference June 25-28, 2013, in Minneapolis, Minn. The nominating county Farm Bureau also will receive a $300 cash award. TFB has honored Israel Flores, a fourth grade teacher at Gilbert Mircovich Elementary in Ingleside, with its 2012 Agriculture in the Classroom Outstanding Teacher award.